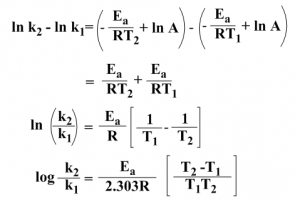 Here k = the rate of reaction, A = pre-exponential factor, Ea = activation energy, R = gas constant and T = Kelvin temperature. The temperature must be measured or converted to kelvin. R is the gas constant. The value of R is calculated from the ideal gas equation PV = nRT, which relates temperature, pressure and volume of a particular moles of a gas. 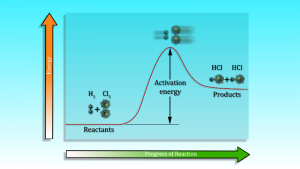 The activation energy of a reaction is the minimum energy required for the reactants to form the the products. It must be expressed on joules per mole. Pre-exponential factor A is also known as frequency factor which includes the frequency of collision and its orientation. It is normally constant in a small temperature ranges. The equation (v) corresponds to the straight line equation y = mx + b. 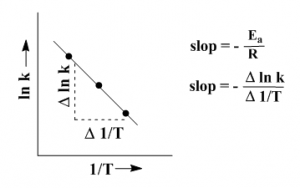 The two variables in this equation are ln k and 1/T. Plotting these two we get a straight line. From the slop of the line we can calculate Ea. 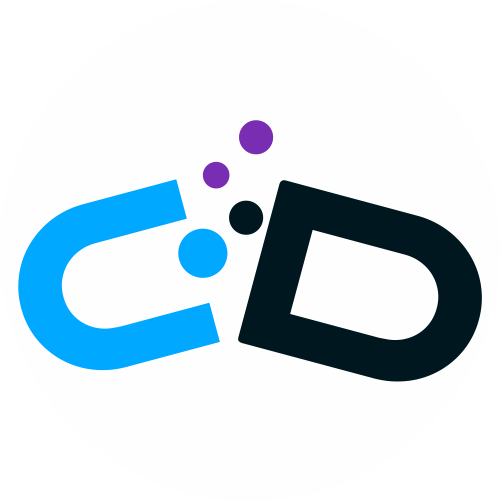 The collision theory states that the gaseous chemical reaction occurs when molecules collide with sufficient kinetic energy along their lines of center that exceeds activation energy Ea. The mathematical expression of this theory is very similar to the Arrhenius equation. A partial bond is formed between A and B with the weakening of bond B-C at the same time. This stage is known as transition state and written with dotted line as A—B—C. The expression of transition state theory to get Gibbs energy of activation also similar to the Arrhenius equation. Arrhenius argued reactants must require minimum amount of energy, greater than its activation energy Ea to form the product. This activation energy can be calculated by using the Arrhenius equation. Use of a catalyst provide an alternative pathway with lowering of activation energy Ecat. 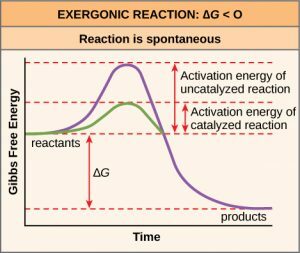 Since the rate of reaction depends on activation energy, lowering of activation energy in presence of suitable catalyst the reaction go faster or the rate of the reaction increases.